According to legend, the French dip sandwich was developed in the early 1900s by Philippe Mathieu, a Southern California restaurant owner who accidentally dropped a French roll intended for a roast beef sandwich into a pan of hot meat juices, then served the "dipped" sandwich to a police officer who recommended the entree to his friends. The modern French dip sandwich typically consists of thinly sliced roast beef served with or without cheese on a crusty roll and accompanied by a small dish of au jus, or seasoned beef stock, for dipping. French dip sandwiches can be extremely high in sodium and fat. To include them in a healthy, balanced diet, eat them only occasionally and in moderation. A plain, commercially available French dip sandwich may contain 481 calories, with more than half of these calories coming from fat. One popular fast food French dip sandwich has 33 grams of total fat and 25 grams of saturated fat. For a healthy adult following a 2,000-calorie diet, this amount of saturated fat is more than the 15 grams recommended as the daily limit. A French dip sandwich also contains approximately 60 milligrams of cholesterol, or 20 percent of the total cholesterol an adult should have each day. A typical French dip sandwich provides about 18 grams of protein. For a woman between 19 and 70 years old, this amount is 39 percent of her daily protein requirement; for a man of the same age, it is 32 percent. French dip sandwiches that contain cheese, the most popular being Swiss or provolone, will contain slightly more protein. A basic fast food French dip sandwich with Swiss cheese has about 21 grams of protein. 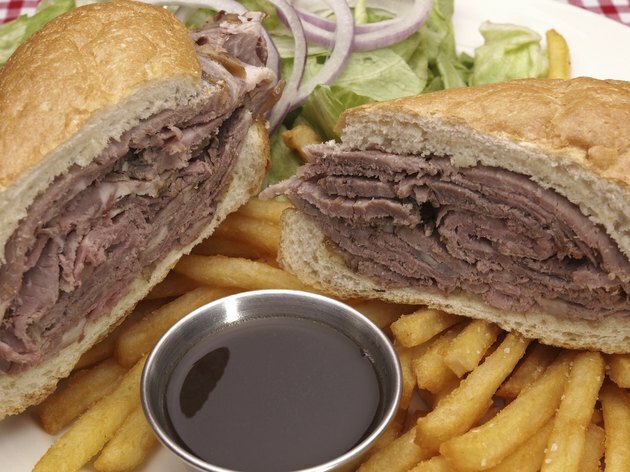 French dip sandwiches are rich in starch, but not in simple sugars or dietary fiber. A single sandwich may contain 50 grams of total carbohydrates, with only 2 grams contributed by sugars and 1 gram from dietary fiber. To increase the fiber in a French dip sandwich, ask for yours to be served on whole-wheat bread, or prepare your own at home with homemade or store-bought whole-grain rolls, buns or bread. Commercial French dip sandwiches provide essential minerals such as iron and calcium but also contain a high concentration of sodium, with a single serving supplying more than 1,000 milligrams of sodium. The Centers for Disease Control and Prevention says that healthy adults should not consume more than 2,300 milligrams of sodium each day. The CDC also advises that the elderly, African-Americans and people who suffer from hypertension, kidney disease or diabetes should not consume more than 1,500 milligrams daily. To keep your sodium intake in control, prepare your own French dip sandwiches at home with low-sodium bread and no added salt to either the meat or the au jus. The roast beef in a French dip sandwich is a good source of a number of B vitamins, including niacin, vitamin B-12, vitamin B-6, riboflavin, thiamin and pantothenic acid. These nutrients play a vital role in energy metabolism and in the production of red blood cells. French dip sandwiches are also high in vitamin A, which is required for proper cell reproduction, immune system health and the synthesis of the rhodopsin needed for your eyes to absorb light.